One of the dreams I have is to illustrate my own children’s story book. I have made halfhearted attempts in following that dream, but am easily discouraged by others comments and a deep rooted belief that I am not good enough. I learnt a lesson this week. I can do it. I was being held back by my belief that I could not do the illustration well enough for publishing. You see I sent my treasured story and illustrations off to the publishers. I got news back they liked the story but they did not want coloured pencil illustrations, they wanted watercolours and a freer style. I put the whole thing on the shelf as a ‘too hard to do’ item. A week ago I got an email from them asking if I was going to do the illustrations in watercolour and if not could they get someone else to do them. That moved me. I was not going to let someone else illustrate my baby. I brooded for a few days. It was Tracey Fletcher Kings comment on my Icad cards, about the quirkiness of them that set off a light bulb moment. My story was quirky, and I have been doing watercolour stuff for Icad. Der!! But then the gnomes had a field day. “Yeah, but you are no good blah blah…” “Excuse me!” A voice chimed in, “what about your floral watercolours, you are good at that!” Yes I am, I thought, then it hit me the florals don’t matter to me, the illustration is very important to me, it is from my heart, and fear of failure is holding me back. 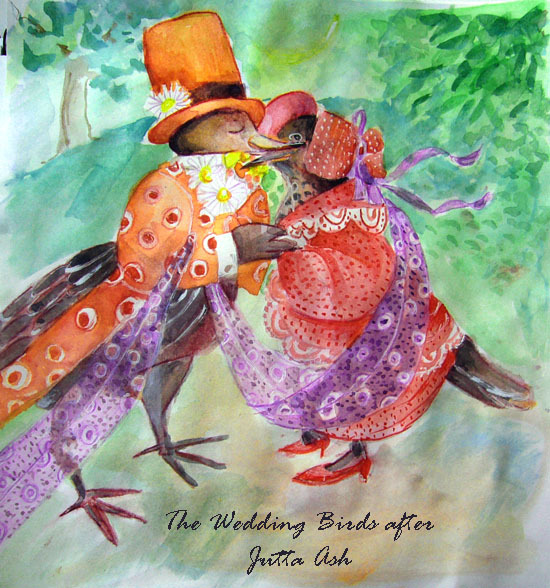 To cut the story short I got out one my favourite children’s book Wedding Birds by Jutta Ash, and drooled. “Hey! My inner voice said why don’t you copy one of the pictures and see if you can.” Well, I can, and even on crappy paper that I couldn’t work the paint and that buckled like crazy. So the moral of this story is if there is something you want to do TRY IT. DON’T LISTEN TO THE GNOMES IN YOUR HEAD! I believe God led me to read your post today, Sharon. I've been feeling exactly the way you are about venturing into some scary artsy terrains. Your words have inspired me to try, as has your beautiful wedding birds illustration. Congratulations on having the publisher accept your book for publication. Blessings! Glad you have persevered, you are very talented, believe in yourself always! Love your tweet birds...inspiring story...CONGRATS on spreading your wings so you could fly! 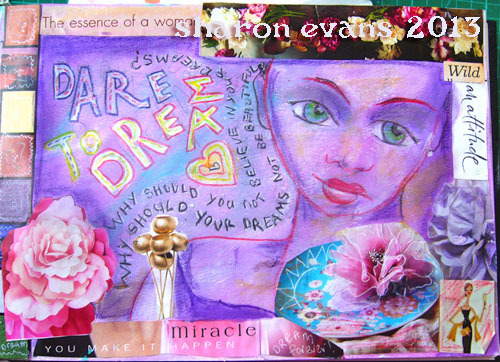 AMAZING dear Sharon! just AMAZING! Shirley if you don't believe in yourself, remember, there are a lot of people around the net who do (me included)! Your art is so beautiful, sure you will manage this. Please let us know how the story is going to developed. Your wedding birds are really stunning! I totally agree with you, if you set your mind to it you can do it. I am pleased you are trying and I am looking forward to see more of your water colours! oh how sweet are these Wedding Birds!!!! lovely work!!! Spectacular post..beautiful inspiring words....shine on and keep shining!Super gorgeous art...I am so enchanted...stunning and vibrant and very special! Those gnomes try to trip us up but you've taken it power away and you will make beautiful art that is perfect for YOUR book! Hi Ms Sharon, I saw your blog from Ms Christine's. It's certainly difficult to disregard some negative thoughts especially when I know I'm weak in that area. But dwelling on those thoughts will not help me in any way, hahaha. What an inspiring post! Your painting is so lovely, you should definitely keep at it and get that book published - I wish you the best of luck! I'm going through something similar with trying to loosen up when drawing and experimenting with different mediums - and you are right, if there's something we want to do we should just go for it, and dismiss all the negative doubting voices! You are so prodigiously talented and your pictures and artwork are/is always such an awesome surprise! Wonderful!